Alhaji Atiku Abubakar, the presidential candidate of the Peoples Democratic Party (PDP), yesterday got a boost following the decision of two candidates to drop out of the race in support of the candidacy of the former Vice President. Dr Nicolas Felix and Barrister Chuks Nwachukwu, Presidential candidates of the Peoples Coalition Party, PCP and the All Grassroots Alliance, AGA, respectively, announced their endorsement of Atiku at a press conference in Abuja on Tuesday. According to them, the former Vice President has demonstrated sufficient willingness to address the multi-faceted challenges facing the nation, adding that as result, they resolved to work with him after getting the permission of their teeming supporters to do so. Felix who was the first to address newsmen said Atiku if elected would bring the nation back on her feet, saying of all the candidates, the Wazirin Adamawa has what it takes to make a positive difference in the lives of Nigerians if given the opportunity. He said: “I have been able to identify amongst my fellow Presidential candidates a man of undeniable political and business exploits whose track records and ideals align vividly to what we believe in, ‘To Make Nigeria Work Again’. “Therefore, considering specific political parameters involved in our fight against nepotism, injustice, abuse of the rule of law, as well as economic decline, we must take a stand in the general election. “Today as Presidential candidates we are joining the team of progressive to do the needful for the development of Nigeria as a Nation. 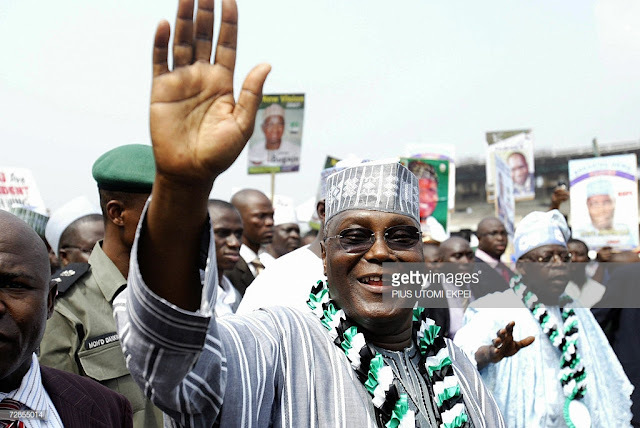 “After careful consideration and several meetings among some Presidential candidates, I Dr Nicolas Felix the Presidential candidate of Peoples Coalition Party, PCP, together with Barrister Chucks Nwachuku the Presidential Candidate of All Grassroot Alliance (AGA) are officially and enthusiastically declaring our support for the Presidential Candidate of the Peoples Democratic Party, PDP, Alhaji Atiku Abubakar. “On this note, we are urging all our supporters and millions of youths across the country on February 16th 2019 as they go to the polls, to vote for Alhaji Atiku Abubakar. On what motivated him to drop out of the race, the PCP candidate said his sacrifice “is borne of the need for a great Nigeria for all. It is borne out of unselfish ambition and patriotic moves towards a greater Nigerian.” An Atiku-led government, he noted will provide job opportunities for the youths as well as revamp the ailing education sector. “Under him (Atiku), our power sector would deliver not only to the few but every citizen of this great country. “Under him, we can have a restructured Nigeria where the opinions of all would be heard and examined without being marginalized. “Under him, the lives and properties of Nigerians would be secured irrespective of their origin, religion and ethnicity. “Under him, we can be sure that our infrastructural development and critical sectors would be upgraded to international standard,” he added. On his part, Barrister Nwachukwu took a swipe at incumbent administration, stressing that in the guise of an anti-corruption fight, the nation have been subjected to democratic infractions in the past four years. “As has been the case throughout our history, in the name of fighting corruption; we have been served in the past four years, like prisoners in our land, the odious meal of destruction of our institutions through nepotism and inflection of institutional culture to achieve narrow, malicious ends. “The judiciary, the most sacred of our institutions, has been the latest victim- stripped naked of its dignity and self-confidence in the market square,” he stated. Atiku was represented at the event by one of his longtime associates, Elder Chike Obi.